TV & Reality Jobs>Reality TV Jobs>Does Someone Owe you Money? Your Chance to Appear on Popular ITV Daytime Show! 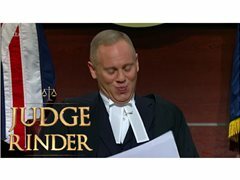 JUDGE RINDER is looking for new cases to solve in his hit ITV courtroom show. DOES: your ex owe child maintenance? Has your neighbour nicked your lawnmower? Friend or family member owe you money? Someone damaged your belongings but refuse to pay? ALL of these are cases that have been heard before and been resolved by the Judge. If you aren't sure whether your case is appropriate, just get in touch to find out.